Cause: The hose was not inserted properly to the fitting assembly. All the grips in the shell must hold the fitting properly onto the hose. In fact the last grip in the shell is crucial in developing the holding strength of the fitting to the hose. Solution: The hose assembly needs to be replaced. You should mark the cover of the new hose as per the value recommended in the brochure before you insert it into the fitting and then push the hose into the fitting till the end of the shell aligns with the mark. You can also use insertion-depth gauge for this purpose. Problem 2: The hose is hard and brittle. Cracks start appearing on its cover when you expose the hose at a room temperature. After the removal from application, the assembly may remain in its installation shape. Apart from that, the cover appears to be charred and dried out. Cause: Such a situation arises when the hose is exposed to heat which exceeds the recommended temperature level and the plasticizers in the elastomer which gives hose the flexibility gets broken down or hardened. The hose gets hardened due to the aerated oil which causes oxidation in the inner tube of the hose. Solution: You should review the application first. Then adjust the temperature of the fluid or the ambient air according to the working limits of the hose. Replace the hose with the one that qualifies for a higher temperature rating. Install shields or heat guards if ambient heat is the reason. If high fluid temperature is the reason, you should install a heat exchanger to reduce the fluid temperature alternatively you can also evaluate system design to improve the efficiency. Problem 3: Leakage happens between the hose and the shell of the fitting as fitting might have blown off. Cause: The shell of the fitting was compressed too much or too less during assembly. 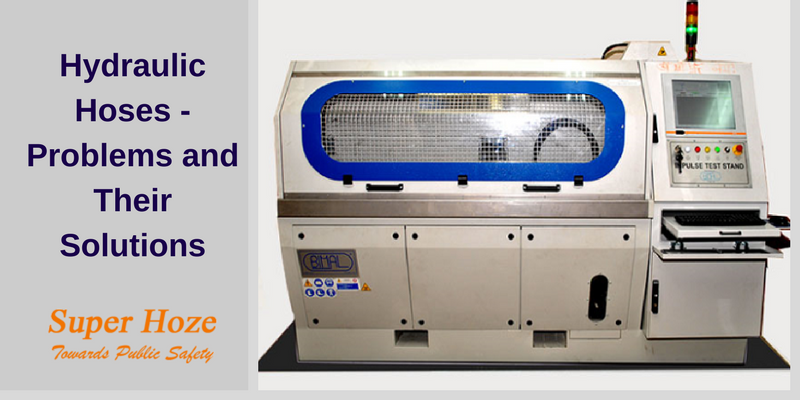 Solution: The hose assembly should be replaced and look for adequate fitting usage and carefully review the instructions given for the usage of compressing machine which includes proper tooling as well. Problem 4: The wire reinforcement has failed in the braid outside the hose and there is little outward deflection of the wire in the failed area. Cause: It normally happens when a hose exceeds its service life and can’t bear the amount of pressure or the continuous flexing of hose in one area. Solution: Replace the assembly after reviewing the application. Problem 5: The hose leaks through weepage or pinholes and/or bubbles containing fluid appear on the cover near the fitting. Alternatively, the hose has been burst near the fitting with a possibility of corroded wires without any cover damage. Cause: It happened because the hose was damaged or cut during fitting the assembly due to lack of adequate lubrication. The improper assembly fitting allowed the moisture to enter around the fitting’s socket which resulted in the corrosion of reinforcement wires. Solution: Replace the hose assembly after reviewing the assembly techniques. Problem 6: There is a visible external damage to the cover of the hose. The hose has exploded in the area of obvious twist or wires have been broken in the area of failure. Cause: Due to lack of proper lubrication, the hose got bent while assembly of the fitting. Solution: After reviewing the proper hose assembly procedures, replace the hose assembly and re-route it and add clamps if needed. The hose layline should be used as a guide to ensure that the hose flexes in one plane only. Problem 7: Due to hose burst, the cover appears to be torn and deteriorated. Apart from that, the reinforcement wires are showing signs of being corroded, broken and being rubbed. Cause: It happened due to the excessive chafing or rubbing of the hose against some external objects such as brackets, sharp corners, wrong size clamp or even other hoses. Solution: The hose assembly should be replaced and hose guards or protective sleeves should be used. Re-route the hose assembly and if required, install proper size clamps to avoid contact between other objects and the hose. Problem 8: The inner tube of the hose is showing signs of delamination and swelling and is badly deteriorated. In some of the cases, it might be washed out to some extent. Cause: The inner tube material is incompatible with the fluid. Solution: Either replace the hose assembly with the hose which gels well with the fluid or replace the the fluid with one which is suitable for the hose you are using. Problem 9: The hose burst has happened in a very clean fashion with no signs of cover abrasion or wire-on-wire abrasion and no random wire breakage. Cause: More pressure was applied in the range of the minimum burst rating recommended for the hose. Solution: The system pressure should be adjusted within the established working pressure of the hose or replace the hose having higher working pressure. Problem 10: The hose is leaking profusely through the cover with inner tube exhibiting gouges through to the braid of the wire along several inches of its length. Cause: The high velocity fluid emitting from the orifice and striking the inner tube has led to its erosion. Particles present in the fluid are also responsible for the erosion. Solution: The hose assembly is tightly bent that’s why it is creating hurdles in the smooth flowing of the fluid. It may be possible that the fluid medium is too abrasive for the inner tube of the hose. The best solution is to replace the hose assembly. Aforementioned are some of the problems people may encounter while working with hydraulic hoses at the workplace. To ensure higher productivity and smooth workflow, keep in mind the cause and solution. Super-hoze Industries Pvt.Ltd. is a leading manufacturer and supplier of the finest quality hydraulic hoses in India. We have been serving the leading names in the industry. If you are facing any problems with hydraulic hoses and looking for solutions, call us at (0120) 4854000 or 98166 91906.